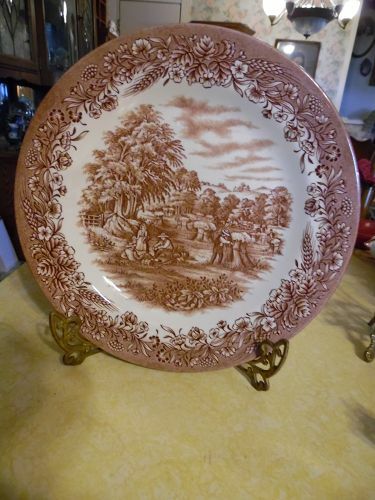 Currier and Ives Harvest dinner plate 10 3/8"
Vintage Brown Transfer Ware Currier & Ives "Harvest" Churchill England Dinner Plate. Light Brown Scenes, Wheat & Flower Rim. Excellent Condition with no damages. About 10 3/8" Wide. I have 2 available. Price is per plate. 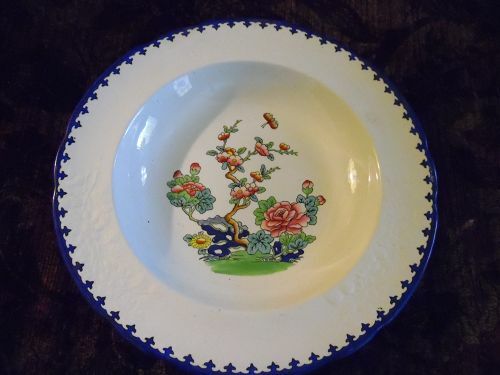 J&G Meakin English Staffordshire Cornflower oval platter 12"
J. & G. MEAKIN Cornflower. 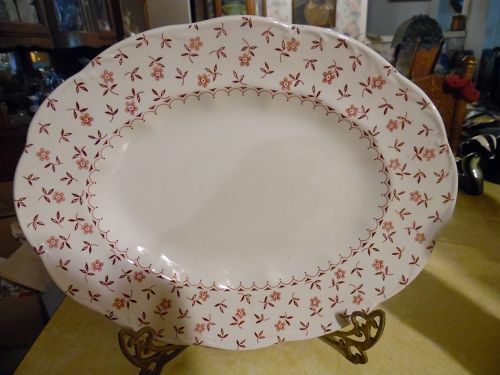 (tiny pink flowers) English Staffordshire Oval serving platter 12" in length. 9 1/4" in width In very good vintage condition. No chips, cracks. Tese is however crazing in the center area. I have 2 available. 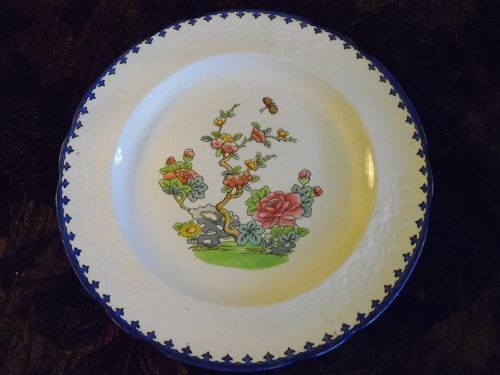 Asiatic Pheasant Powder blue & White Toile Royal Stafford /Burslem, Made in England .. 8.5" salad plate in the Asiatic Pattern .... Pheasant with floral center and wide floral border. Condition: Like New ... I see no chips, cracks or utensil marks .. OI just have 0ne. 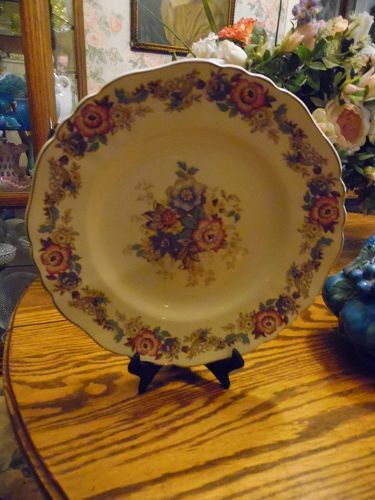 Lovely old pattern by J&G Meakin R 561073. Pattern was registered in 1921. Pilgrim pattern 12 1/4" x 9 3/4" oval platter. Lovely floral border and center of rose blue and yellow flowers. 22k gold edge trim. Pristine condition with no chips or cracks. I have several pieces listed in this pattern in the catalog. Save $ by combining shipping. 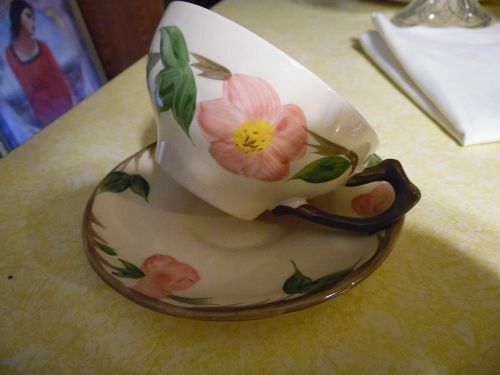 Lovely old pattern by J&G Meakin R 561073. Pattern was registered in 1921. Pilgrim pattern 10" dinner plate. Lovely floral border and center of rose blue and yellow flowers. 22k gold edge trim. Pristine condition with no chips or cracks. This is for one dinner plate. I have 10 available plus I have several pieces listed in this pattern in the catalog. Save $ by combining shipping. Lovely old pattern by J&G Meakin R 561073. Pattern was registered in 1921. 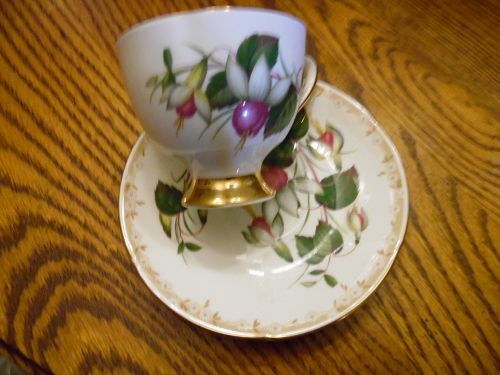 Pilgrim pattern cup with matching saucer. Lovely floral border and center of rose blue and yellow flowers. 22k gold edge trim. Pristine condition with no chips or cracks. This is for one cup with matching saucer. I have 6 sets available plus I have several pieces listed in this pattern in the catalog. Save $ by combining shipping. 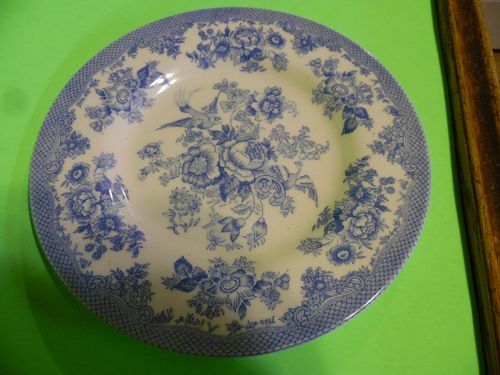 Lovely old pattern by J&G Meakin R 561073. Pattern was registered in 1921. Pilgrim pattern 7 1/2" coupe soup bowl. Lovely floral border and center of rose blue and yellow flowers. 22k gold edge trim. Pristine condition with no chips or cracks. This is for one bowl. I have 8 available plus I have several pieces listed in this pattern in the catalog. Save $ by combining shipping. Lovely old pattern by J&G Meakin R 561073. Pattern was registered in 1921. 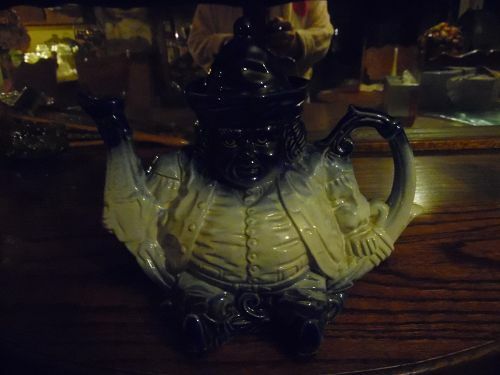 Pilgrim pattern creamer. Lovely floral border and center of rose blue and yellow flowers. 22k gold edge trim. Has tin chips on the lip which is not so noticeable but a chip on the foot which is more-so. I have several pieces listed in this pattern in the catalog. Save $ by combining shipping. 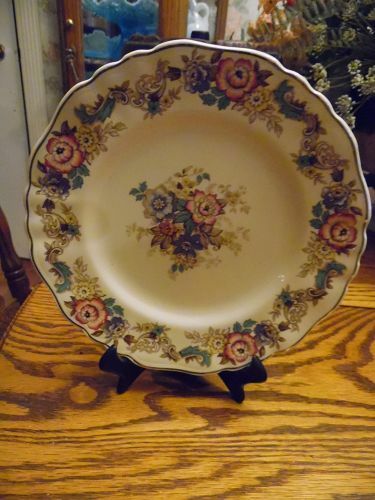 Lovely old pattern by J&G Meakin R 561073. Pattern was registered in 1921. Pilgrim pattern sugar bowl with lid. Lovely floral border and center of rose blue and yellow flowers. 22k gold edge trim. Pristine condition with no chips or cracks. I have several pieces listed in this pattern in the catalog. Save $ by combining shipping. Lovely old pattern by J&G Meakin R 561073. Pattern was registered in 1921. Pilgrim pattern 6" bread and butter plate. Lovely floral border and center of rose blue and yellow flowers. 22k gold edge trim. Pristine condition with no chips or cracks. I have 6 available plus I have several pieces listed in this pattern in the catalog. Save $ by combining shipping. 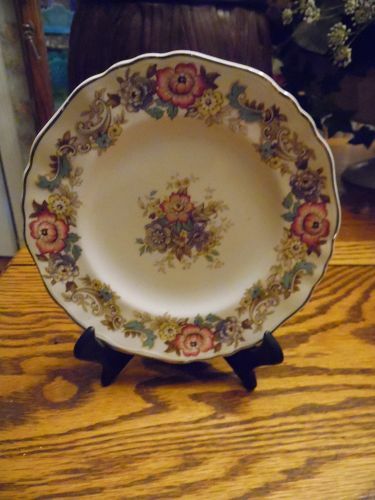 Lovely old pattern by J&G Meakin R 561073. Pattern was registered in 1921. Pilgrim pattern 8" diameter salad plate. Lovely floral border and center of rose blue and yellow flowers. 22k gold edge trim. Pristine condition with no chips or cracks. I have 8 available plus I have several pieces listed in this pattern in the catalog. Save $ by combining shipping. Lovely old pattern by J&G Meakin R 561073. Pattern was registered in 1921. 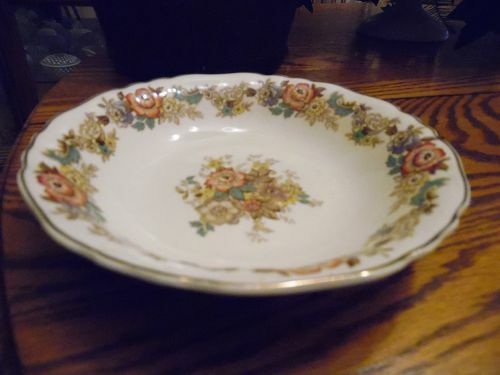 Pilgrim pattern sweet oval vegetable bowl measures 16 1/4 x 12 1/2". Lovely floral border and center of rose blue and yellow flowers. 22k gold edge trim. Very good condition with no chips or cracks. There is however grazing but no darkening or staining. Flowers are in the direct center, but the angle and my poor photography skills makes it looks like the design is not centered, but it is.